This morning, the Final Fantasy XIV development team unveiled the game’s next major update, Patch 4.3. Titled Under the Moonlight, this patch adds the usual content we’ve come to expect from the MMO every three months, as well as a few surprises. While this Letter from the Producer Live was only part one of their 4.3 preview, they covered a ton of the new additions we’ll see when the patch hits in late May. The biggest news from this Live Letter comes from outside the game. FFXIV Companion is the app they’ve been hinting at for years. They have a ways to go until it's ready, as evidenced by the amusing bugs producer Naoki Yoshida experienced while showing off the service, but it’s still an ambitious little tool. Chat with players on your friends list. A scheduler for in-game events like raids. View and organize personal, retainer, and saddlebag inventories. Buying and selling items on the market board. That last one could bear a more detailed explanation. 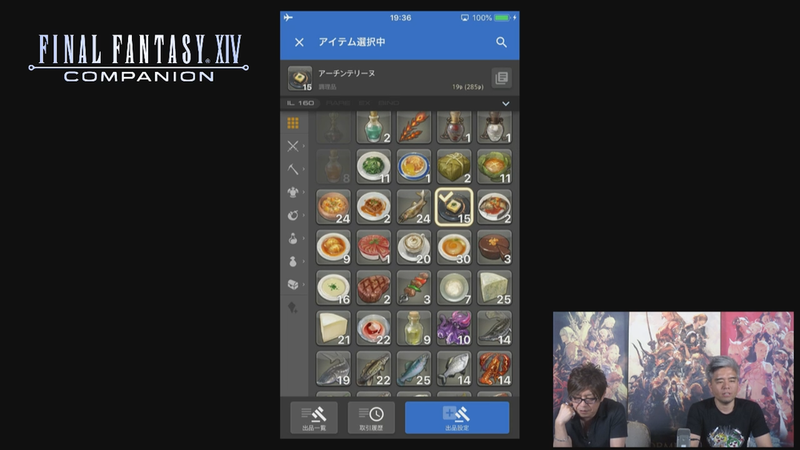 Based on the slides, it seems like viewing the market board via FFXIV Companion is free, but posting an item for sale or buying an item will cost a kupo nut. Kupo nuts are awarded each day as a login bonus for using the app. Premium users will receive an additional kupo nut and have a larger kupo nut capacity than free users. 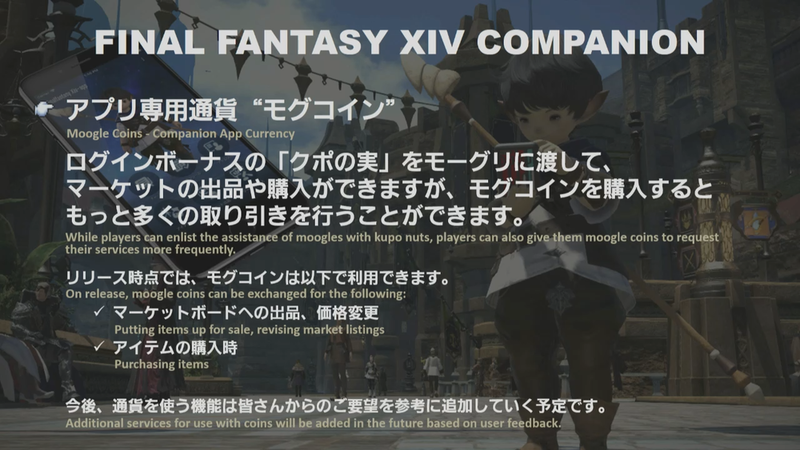 Additionally, moogle coins can be used in the same way as kupo nuts, but cost real money. It's weird, but if I'm interpreting correctly, it simply means you have the option of spending your free currency to post/buy market board items through the app, but if you run out of that, you can then pay real money to replace them. It's a neat measure to prevent players from scheming the economy via the app (while making some money on the side), but we'll see how it plays out in practice. Check the slideshow below to hear it from them. With this being an even-numbered patch, we'll see only one new level 70 dungeon, The Swallow's Compass. If I'm not mistaken, it's behind those giant doors in Yanxia. The new extreme trial is actually a mystery. It won't follow the Four Lords storyline introduced in Patch 4.2 with Byakko. It's connected to the main story somehow. They used a similar structure in Heavensward, where we were introduced to The Warring Triad with Sephirot, then detoured to fight Nidhogg for the next patch's trial. There is, however, a side quest continuing the tale of the Four Lords. It just won't feature a major trial this time around. As expected, this patch will bring the next 24-player raid. The second chapter in the Return to Ivalice story takes us to The Ridorana Lighthouse. Those familiar with Final Fantasy XII will recognize it as The Pharos. I'm assuming the name change has to do with there already being a tower in FFXIV called Pharos Sirius. Details will come at a later date but they did mention loot in this raid will be greed only. Fan translations say this change is a response to the team realizing most players use gear from these raids to improve their sub-jobs. The idea is to make it easier to gear those classes, and mitigate players losing drops to need rolls. It's a controversial decision, to say the least. Lastly, there's also a crafting and gathering-based side quest attached to the Return to Ivalice story, but details on this are forthcoming. There's a new Deep Dungeon! That giant Jenga tower in The Ruby Sea is apparently a 100-floor Palace of the Dead sequel titled Heaven-on-High. The first 30 floors will serve as a Palace of the Dead stand-in for leveling from level 60 to 70. Floors 31-100 are designed as challenge stages for a pre-made party of four, similar to floors 100-200 of PotD. The next stage of The Forbidden Land: Eureka is coming sooner than I expected. There's very little information on Eureka Pagos other than that it will be similar in scope to Eureka Anemos, and won't come until Patch 4.35. However, Patch 4.3 will have content branching Anemos and Pagos. There's a follow-up to The Unending Coil titled The Minstrel's Ballad: The Weapon's Refrain (Ultimate). Yep. There's an Ultima Ultimate. Again, details will likely come in the next Live Letter, but Yoshida hinted that you won't directly fight Ultima Weapon upon entering, similar to the way Ultimate Coil has smaller fights before the Bahamut encounter. This one releases in Patch 4.31, probably about two weeks after 4.3 drops. Expect this to be another super high-end raid for those who have already wrapped up The Sigmascape (Savage). Under the Moonlight's main scenario quest line is being billed as the conclusion to the saga of Doma. That's an exciting premise on its own, and I personally wasn't expecting the Doma story to close out this soon. Although... this is 4.3 and by the x.5 patch we're usually already seeing a new expansion, so perhaps now is the time to start wrapping up Stormblood's story. This patch brings new beast tribe daily quests, this time in the form of quests for the namazu. If you don't remember, they're the untrustworthy fish people from Yanxia. Unlike the Moogle beast tribe quests from Heavensward these dailies will be accessible to both crafters and gatherers. They teased a new mount for the next Live Letter. We'll see several side quest chains, in addition to the Four Lords and Return to Ivalice quests I mentioned above. There's more coming for the Doman reconstruction story as well. Balance changes for dark knight, astrologian, and samurai. No details yet. PVP HUD improvements to better show buffs and debuffs on enemies. They're making changes to the PVP roulette algorithms as well. New sounds, animations, and other improvements for the bard performance mode. They mentioned having spent a lot of resources on these upgrades. Cross-server linkshells! They'll be limited to 64 players at first, but that number may improve based on the impact on server stability. Houses will get a guestbook feature. Players can leave comments and there will also be a "Like" button. Mannequins will be added for housing as well. No details yet, but this is something people have wanted forever. New dungeons for Grand Company squadrons. New clients for custom deliveries. They specified it's not a miqo'te and there's something about equipping gear to them...? Duty Roulette: Raids for normal raids. I think this only includes normal Alexander raids at the moment, but it's a great idea either way. I wouldn't mind going back and then forward and back. Gear from the latest gear design contest (the caster gear one?) will be implemented in 4.3. As usual, it's a lot of stuff. If they stick to tradition, the next Letter from the Produce Live will have much more information on the smaller changes of Under the Moonlight, like the balance stuff and linkshells. We'll also see more gear, get lots of footage of the new content, and get a release date at that time. I'll do my best to make another post like this one when it happens, because I tend to be the person my friends come to for Live Letter information, anyway. Reach out to us on Facebook or Twitter if there's something important I missed. It's a lot of info to parse at 6am.